Jim Nutt first attracted international attention as a member of a six-member group called the Hairy Who. They exhibited together several times between 1966-69 around the country but were based initially Chicago. The group espoused no collective philosophy or formal manifesto but came together out of shared sensibilities. Comics, humor, hygiene ads, vernacular material culture in Chicago (hand-painted signs, pinball machines, product catalogues), and bawdy puns populated their work. Among artists drawing on popular culture in the 1960s, they gravitated to the odd, the disturbing, and the ultra-local. 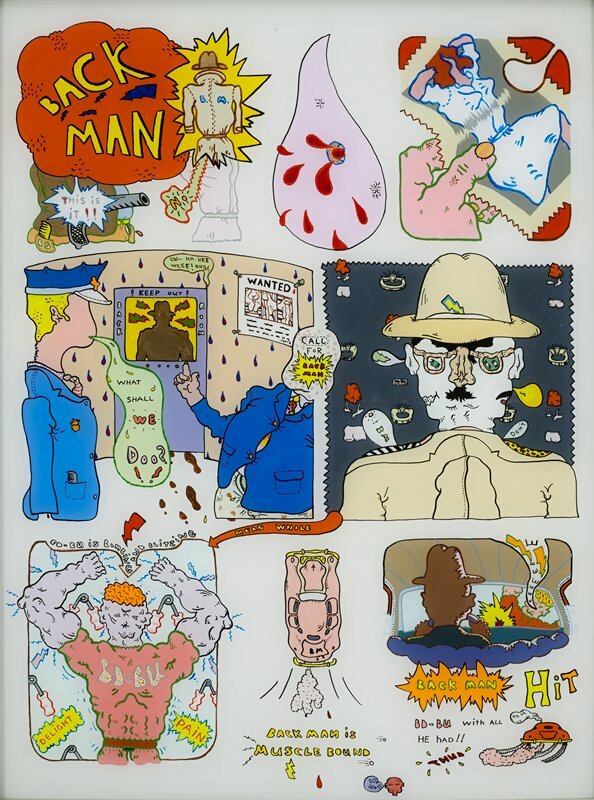 Nutt’s Backman exemplifies these tendencies in their work in 1966; exquisitely made in a painstaking technique (the image was painted on the reverse side of a piece of pristine smooth Plexiglas) but with a comics subject matter that is invented, absurdist, violent and perplexing.